Product Description This 2cu.ft. 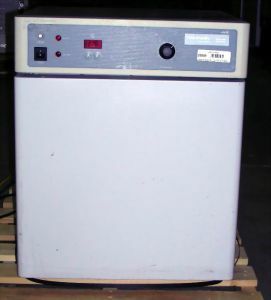 VWR 1525 warm air jacketed incubator has heating elements in all three walls, bottom, and door create a warm air jacket around the inner chamber to guarantee superior temperature uniformity with no hot spots. Temperature range is 5C above ambient to 60C, ±0.25C at 37C. Warm air jacket design also provides quick temperature recovery - and there's a full-length inner glass door for viewing specimens without disturbing the chamber atmosphere. Microprocessor controlled for easy keypad set and calibration. Temperature display may be calibrated to match a secondary thermometer. For over-temperature protection, a second, independent safety controller can be preset and has visual alarm when activated. Incubator is stackable without the need for spacer racks. Features through-wall access port for chart recorder. A UL-approved, vapor-tight electrical outlet is inside the sealed chamber. Adjustable leveling feet compensate for uneven surfaces. Shelves adjustable in 1.3cm (1/2") increments.